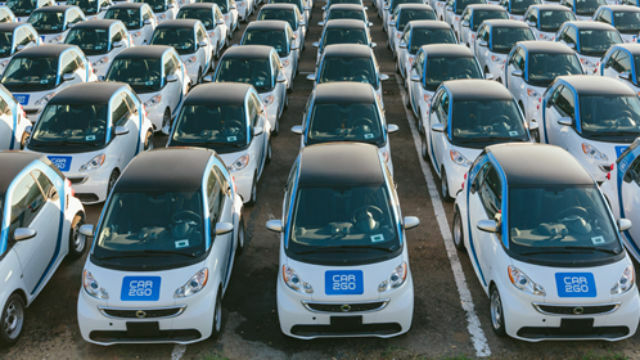 San Diego members of the car-sharing company car2go will be able drive new, more powerful 2014 models of Daimler smart fortwo electric vehicles starting Wednesday. The company said 400 of the new vehicles are now available to its 33,000 local members. The previous fleet dated to 2010. “San Diego is fast becoming the nation’s electric vehicle capital, and with the largest electric car-sharing fleet in the nation, we are proud to continue our commitment in preserving the local environment of our great city,” said Will Berry, car2go San Diego Location Manager. “The new 2014 vehicles, while maintaining the zero-emissions footprint, have a much smoother acceleration, and overall, a more comfortable car2go driving experience that our members will truly enjoy,” Berry said. Since its launch in 2011, the company has tallied over 1,000,000 trips in the San Diego area. Car2go is a subsidiary of Daimler AG, the maker of Mercedes-Benz automobiles.